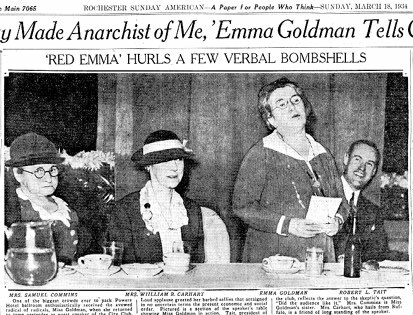 With the exception of a brief ninety-day lecture tour in 1934, Emma Goldman spent the remaining twenty-one years of her life (1919-1940) in exile from the United States. During this period she lived in Russia, Sweden, Germany, France, England, and Canada, never finding a political "home" outside the United States. In no country did Emma Goldman feel more estranged than in her native Russia. She was shocked by the ruthless authoritarianism of the Bolshevik regime, its severe repression of anarchists, and its disregard for individual freedom. But she continued to defend the revolution, which she distinguished from the subsequent Bolshevik regime. She argued forcefully in My Disillusionment in Russia (1923) that the emergence of the Bolshevik party-state actually crushed the revolution. Notwithstanding the prescience of this critique, the persistence and stridency of her anti-Bolshevism alienated her from many European and American leftists. Perhaps in part to counter this estrangement and the loneliness of her exile years, Emma maintained a lively correspondence with a large number of Americans and Europeans, and was active in the American expatriate community in France. In the 1920s and 1930s, while struggling to survive economically and frustrated by the restrictions her status as an exile imposed on her political activities, Emma engaged in a variety of literary projects. The most important and enduring product of this period of writing and reflection is her moving one thousand-page autobiography, Living My Life (1931). Her letters and papers--many of which come from this period--complement this monumental work by showing the full spectrum of Goldman's interests and associations. In 1989, Glasnost opened archival exchanges of material that illustrated internal debates within the Soviet Union. 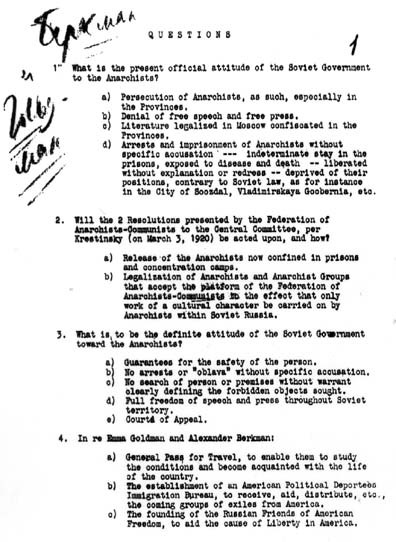 This release from the former Central Party Archives shows the questions presented to Lenin in 1920 by Goldman and Berkman about the suppression of dissent and persecution of anarchists. He recorded their names, (which appear handwritten in the margins), as he listened to their concerns. The inadequacy of Lenin's response as well as growing repression in Russia, and the slaughter of the Kronstadt rebels in 1921 prompted the two anarchists to leave Russia and try to stir up outside pressure to influence the situation there, while continuing to support the early vision of the revolution. 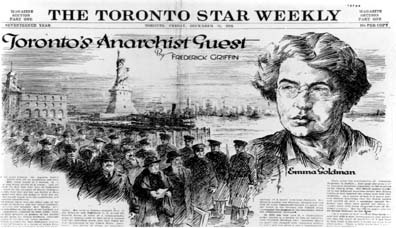 During her exile, Emma Goldman continued to apply her principles of free speech not just to the United States, but to the Soviet Union as well. Angered by the suppression of anti-Bolshevik dissent in Russia, Goldman registered her protest with Lenin himself and left the country within two years hoping to alert the world to the injustice she had witnessed. Her courageous position left her vulnerable to criticism from the Left as well as from the Right and isolated her even further. In 1924, she moved to London. Despite her association with a wide circle of left-wing and liberal British intellectuals, Goldman felt lonely in England and frequently complained about the stolidity and reserve of the British. "Even the best English paralyze me," she wrote Berkman. Before she could leave England, however, she had to ensure that she would have right of residency somewhere. Despite her political objections to the institution of marriage, she engaged in the legal formality of marriage to an elderly coal miner from Wales named James Colton to secure the mobility and privilege of British citizenship. During her exile, Emma Goldman and her attorneys appealed repeatedly to Washington for permission to re-enter the United States. Goldman hoped to return since her friends and family were there and because she believed she could be more effective politically in the United States The Roosevelt administration was the first to respond positively to her appeals, but even the liberal New Dealers would only allow her to return for a ninety-day visit, during which she was ordered to confine her lectures to topics involving literature and drama. Goldman's 1934 speaking tour was well received by the American Left--but not by the FBI, which, under Hoover's orders, trailed her. She spoke on the "drama" of world events, fascism, Stalinism, and Hitlerism. Her return to New York was front-page news in all the city's major newspapers. On March 17, 1934, she spoke to a large audience in Rochester, New York, where she had spent her first three years in the United States (1886-1889). She enjoyed taking quick swipes and engaging the audience with her flamboyant and audacious speaking style. For Emma Goldman, deportation and exile were harsh punishments. Friends reported that just before and immediately after her tour, Goldman often sat at the Canadian border, looking longingly across to the United States, tears streaming down her face.